"Without a doubt the independence movement would never have been so successful without Web 2.0 technologies" says Scottish academic Kathryn Crameri, author of 'Goodbye Spain? The Question of Independence for Catalonia'. She explains that, "in general, the Internet and social media have been used to communicate with supporters or potential supporters, to organise events and to mobilise people to take part in them", and it appears that the Catalan independence movement is no different. 2014 marks 300 years since Catalonia lost its sovereignty and self-government institutions to the Bourbons in the War of Succession, and ever since then there have been some calls for it to become independent again. However, it is only in the last few years that support for independence in Catalonia has grown considerably, with around 50% of the Catalan population supporting the movement in 2014, compared to some 15% 10 years ago. 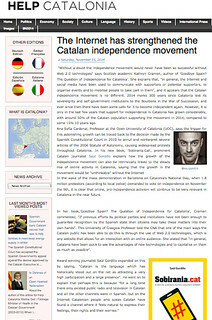 Ana Sofía Cardenal, Professor at the Open University of Catalonia (UOC), says the trigger for this astonishing growth can be traced back to the decision made by the Spanish Constitutional Court in 2010 to annul and reinterpret several articles of the 2006 Statute of Autonomy, causing widespread protests throughout Catalonia. In his new book, 'Sobirania.cat', prominent Catalan journalist Saül Gordillo explains how the growth of the independence movement can also be intrinsically linked to the steady rise of online activity in Catalonia, saying that the growth in the movement would be "unthinkable" without the Internet.